(Sorry, you can skip this part if you like; a bit off topic.) My mother had a massive stroke in 1996, a blood clot that cut off blood supply to almost her entire left hemisphere. It was devastating. She would never again be able to speak (except for yes and no) or read and write or do even simple math. On the day of her stroke, I flew immediately to Portland, Oregon from Japan to meet my brothers by her bedside. I spent most of the first three days sitting beside her bed. She was conscious but virtually unresponsive. I didn't know if it would help, but I held her hand and talked to her anyway during the few times she was awake. Seeing Dr. Taylor's talk gave me some insights into what must have been happening with my mother in those early days and weeks after the stroke. Since my mother never regained speech (though she got language recognition back), she has never been able to tell us about her experience and recovery. However, Dr. Taylor's presentation was illuminating. 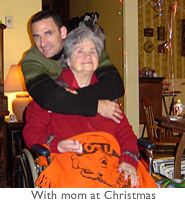 My mother lost movement in her right side and lost most of her "left brain." But something funny has played out over the past eleven years: her so-called right-brain aptitudes seem to have become stronger. She was always a kind woman and well liked, but now she seems even more so. She communicates brilliantly with her smile and her eyes. Although she can not speak, healthcare workers and medical staff always remark how sweet she is, how funny, etc. In 1996 I thought I lost my mother, but what I have found is that—in spite of her loss of (spoken) language production—her personality today is actually an amplification of what it was before. I did not lose my mother at all. If the stroke would have been in the right hemisphere, language production may have remained, but I am not sure if I would recognize her. Dr. Taylor's presentation and my own experience with my mother remind me of something very simple: Life is precious and short, there's no point worrying about the past and the future, they do not really exist anyway. What matters is this moment. And every moment I get a chance to spend with my mother in the USA, or even via a phone call, is a gift I appreciate very much. Istn't it strange how many of us have a personal story that connects us with this powerful talk? My mother also had a sudden stroke caused by when I was 5 years old and she was 33. I also found myself incredibly moved by this talk. I watched that TedTalk yesterday, on a dinky little iPod on the train to work, and I nearly missed my stop to get off. The thing is, brilliant though it was, brave and connected though she was, in the end, one thing was missing. How, short of experiencing a stroke yourself, do you get to the place she had been, and that she was exhorting us to go to? It seemed to connect with various ideas I've heard mentioned in connection with meditation, but I would have been fascinated to have heard at least a hint of how to get there. Or even where to start from. p.s. It is a shame that Ted's poster still for the video actually gives the "visual aids" game away, despite your effort not to. Garr: Long time reader, first time commentator. Thanks for sharing the clip about your mom. It is amazing what a small world we live in and how it connects us. I know a little bit of what it must mean to you to have your mom see the book and the picture. My book was published last year but it was too late for the two people it is dedicated to. Not a day goes by that I wish they could have seen my book and shared my sense of pride in it. you've been doing such a remarkable contribution. Your parents couldn't be more proud about you. I think this Blog posting really illustrates the magic of Blogging. I never imagined that you would read my Blog, and yet look at how deeply it wound up connecting us. Blogging is awesome because we learn more about each other, and connect in ways we could have never imagined possible. Your Blog and book give me strength and insight, so imagine my joy in seeing what a simple Blog posting has done for you and, in effect, this entire community. Thanks for sharing. 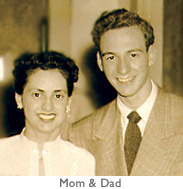 I think we're all thinking a little bit more about our parents right now (always a good thing). Thanks for this post, Garr. I read your blog often, having found it after your book caught my eye while wandering through a bookstore. I also appreciated you sharing the moment with your mother. Is there any moment more special than making your parents proud like that - and for you to show her how much you cared at the same time. For me, I actually can't wait to send the video to my wife and other friends I think it will speak to personally. That is love in your mother's eyes. What a gift for you to share the moment with us. Thank you. Like others, I have watched Dr. Taylor's talk more than once. Not only does she speak succinctly about her experiences, her final question to each of us is illuminating. Beautiful article, very inspiring. Thanks! Thanks for sharing a beautiful moment with your mom. The TED video was very good as well. It made my day to share a little peace and happiness with friends, even if it was digitally. Thanks for doing what so few bloggers attempt when linking to a popular meme: relating it to your own life. I loved the talk by Dr. Jill and was surprised by how moved I was by her words alone. On a completely different note, I preordered your book and received it around Christmas time. I tried to make it last longer, but I read it all in just a few sittings. But here's the "testimonial" part: One of my jobs (other than blogging and running a family business) is with my local fire department. Our new city manager, who was hired because he is able to think "bigger" than the other candidates considered, constantly edits and picks apart presentations, press releases and reports. When it was time for our annual report, which he wanted presented in Powerpoint, I was pretty nervous. Using the techniques in your book and on your site, I submitted the slides AND the text of the chief's speech to his office for review. Those who saw the slides were convinced that I'd get reprimanded, as there were no bullet points and very little text per page. Turns out, my report is the first thing in his six-month as manager that was returned with no more ink than his signature of approval! Thanks, Garr! Your ideas really, really work. Even for us small-town folks. What Dr. Taylor describes as being in LALA-LAND is what I experience as ZEN-STATE during zazen. I have not imagined that someone could describe it so well. Further, her 'acting', her gestures during the presentation are very figurative. Dr. Taylor I have been interested in plants that can heal. I dont know much. I seen people use the plant "Salvia" Zen state.. It makes me wonder if the brain can use one side if it wants to the right If this is possible with drugs then why cant we do this on our own? Have you done any research on these kind of hallucinogentic type plants? They sound exactly the way you said your stroke felt or near death experience. Maria Anderson asks how to get to Lala Land without having a stroke. Timothy Totten then draws a parallel with his 'Zen state'. The key to what the Buddha did 2500+ years ago is to sit down in a quiet place, in a stable posture, every day of your life, and bring all your attention to every 'in' and 'out' breath for, say, l5-25 minutes; notice how that analytical left brain chatter arises endlessly, let the thughts go and just keep coming back to the breath. It might take longer than the stroke but it's a tried and true path. I was amazed watching this video because I am, right now doing a workshop to learn how to get to where Jill is without actually having a stroke. Thank you for your informative story on your brain injury. Garr, Thanks for your personal sharing. I think we can all improve the qualities of our own lives and also the lives of those we love, brain injured or not, by heeding Dr. Taylor's advice. I for one intend to be more present and find my own inner peace more by accessing my right hemisphere. (You have to check out Oprah's 4 interviews with Dr Taylor on Oprah.com soul series). Also, you've got to read MY STROKE OF INSIGHT - Dr. Taylor's book. If you think the TED talk is great (which it is), you'll love the book. I've read it twice and I'm glad I did because I got more out of it the second time (it's a very fast read). Very impressive how well Oprah knew MY STROKE OF INSIGHT, as if she'd read it five times! I've been recommending a book by Jill Bolte Taylor called "My Stroke of Insight" to everyone I know. It's an amazing story, both uplifting and powerful on three levels: physical, emotional, and spiritual, but the spiritual aspect alone makes this the best book I've read all year. How often do you get to hear a neuroscientist describe having a stroke, nearly dying and finding Nirvana, and then making a miraculous recovery so that she's back to teaching medical students!?! I came away with a renewed sense of understanding, wonder and hopefulness about the capabilities of the human brain. I give "My Stroke of Insight" highest marks! I was checking out her book in Borders yesterday. I didn't buy it as it's my birthday tomorrow, and everyone knows (finally at 33) that the best present is book vouchers... I get told off if I buy books within a week of May 31! Apart from, obviously, the things around her right-brain epiphany, the part of the book that sticks in my mind is her list, at the very end, of 40 things she would have requested of people during her recovery. Things like 'Be as patient when taking me through things for the 20th time as you were the first'. (I'm paraphrasing). It's these kind of aspects that people who haven't experienced a stroke need to know in order to best help. 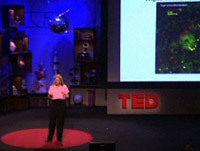 In honour of this amazing woman, I did one of my nerdy moment-by-moment analyses of her Ted.com presentation. She structured her presentation so thoughtfully, that I think it's good to learn not only from her story, but her structure and delivery too. How do we "train" people into the "dynamics" of rescuing themselves as you did when such an incident occurs? The divinity aspect of us is so well brought out by you. It was a spritual experience watching your narration. Your narration of events really touched me. I'm fighting to get my right hand working again, and it's a battle I'm planning to win.